How do I understand the results of my audiogram? You’ve made an appointment with an ENT or Audiologist. They’ve just given you a hearing test. What do you do now? We’re going to walk you through how to read and understand your hearing loss from your audiogram. What do those lines mean on my Audiogram? An audiogram is a graph that shows the softest sounds a person can hear at different pitches or frequencies. Asymmetrical hearing loss is when each ear has a different level or type of hearing loss. Each ear is represented by a different line on the graph. 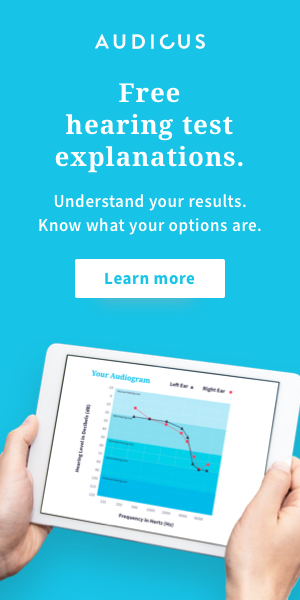 If your graphs or lines look different, you have asymmetrical hearing loss. This is more unusual and signifies that the causes of the loss in each ear are different and therefore must be treated differently. When asymmetrical hearing loss exists, it is best to have your ears checked out by an ENT doctor to ensure that you are a candidate for hearing aids and that no surgery or treatment is needed. The sample graph above reflects an asymmetrical hearing loss as each ear has different levels of hearing loss. Symmetrical Hearing loss is most natural with age-related hearing loss. It implies that hearing loss is the same in both ears. If both lines or graphs look the same, you have symmetrical hearing loss. The graph below shows an audiogram reflecting symmetrical hearing loss. Do I have high or low-frequency hearing loss? Frequency is the unit by which how high or low a sound is measured. Frequency is measured horizontally on the top of your hearing test. As the frequencies go from left to right they range from lower to higher. Example: If you read the audiogram from left to right, the final X is all the way at 8,000 hertz – that means this person would have high-frequency loss. They can only hear above 80 decibels at 8,000 hertz. High-frequency loss makes it difficult to hear higher pitched sounds such as women and children. If the X’s and O’s on your hearing test remain predominantly on the left side, you have low-frequency loss making lower pitched sounds more difficult to hear and understand. What level of hearing loss do I have? Decibels are the unit by which sound is measured. On your audiogram, the decibel loss is measured vertically on the left side. As the number gets bigger, so does your hearing loss. Example: Reading the above audiogram from left to right, the final O (right ear) hits about 68 db or so. This means that anything below 68 db. (Whispered conversations, leaves rustling, birds chirping) will not be heard. The last X (left ear) has slightly more severe hearing loss, hitting at 75 db. Again, this means that any sound below 75 db will be unable to be heard. The graph above shows what kinds of sounds occur at which decibels. This will give you insight into what kinds of sounds you may be missing at each level of hearing loss. Someone with profound loss, for example, (loss up to around 90 – 110 decibels) would only be able to hear the loud sounds of trucks and motorcycles, while missing moderate sounds like a piano, vacuum cleaner, and even softer sounds like whispering and birds chirping. What is a word recognition score? The word recognition score is a measurement of your speech comprehension abilities. Your audiologist will test your brain’s ability to understand language by having you repeat sentences and words back to them. It’s important to understand that the parts of your brain that process speech and hearing are separate. This means that fitting you with hearing aids won’t necessarily improve your speech if it falls below a certain level. Every audiologist has their threshold below which they will not recommend someone to be a hearing aid candidate—for many it is 50%. Bear in mind too, that the longer you go without hearing aids, the more your language muscle atrophies, lowering your score even more. After a certain point, this muscle ceases to work on a functioning level and the damage cannot be restored. All the more reason to get fitted with your Audicus hearing aid as quickly as possible! Hi. Report comment of my father is…B/L Moderate Mixed Hearing Loss. what does it mean? A level of hearing loss in which a person cannot hear a sound unless it is at least 90 decibels loud (about as loud as a lawnmower or a nearby motorcycle). I’ll be 65 yrs soon and I am experiencing a very high pitch ringing in my right ear only. This is constant and has been going on since early November. I have an appointment 2/25 for a audiogram with the PA at an ENT office. Can this test tell me what is causing this ringing? I’ve read that tinnitus is ringing in both ears and if you are experiencing ringing in one ear, you should contact your doctor. I believe the text is referring to the clinical audiogram image above. Hope that helps! Let us know if it is not displaying for you. Why my audiologist did not write down my WRS? But my result is 0 = 50 db, X = 75 db. In that manner what will be my WRS? what does WRS of 88%@70Db mean? Hi Cindy. Get in touch with our team at [email protected] and they’ll be able to tell you all about your word recognition score and what it means! My audiologist said I have WRS and I wear hearing aids. I am 86. What does this mean and how dangerous is this.What would they do to correct this? Hi Onda, if you see “WRS” on your hearing test, that just means word recognition score. This refers to the percentage of the words you understood from the words said to you during the test. If you have a low word recognition score it can mean many things, but in most cases, hearing aids are helpful. You may want to consult your audiologist about your specific situation! If someone has 78db at 8000 Hz n if someone has 40dba at 8000Hz then what is the difference? I still don’t understand how to interpret this audiometery graph. Although i do not experience hearing loss i found this article to be very helpful for studying because of how basic and understanding this is. Great! You can send your hearing test to [email protected] and someone from our customer support team will be waiting to help you. What do you mean by “language muscle” in the last paragraph? How does it atrophy irreversibly when a person with a hearing loss does not wear hearing aids? Thank you. Hello Ellen – What the author is saying that your speech discrimination abilities will worsen if you do not wear hearing aids. Hearing aids cannot help with word recognition, otherwise referred to as speech discrimination, so it is in your favor to get hearing aids sooner, rather than later, if you are experiencing difficulty hearing. Hopefully this answers your question!